The 2016 Chevrolet Trax Review: A war is heating up over the next generation of economy cars. Just like mid-size, tough-looking crossover vehicles have replaced the four-door sedan as America’s family car of choice, the same thing appears to be happening to efficient compact cars. A whole new category of vehicles is cropping up called subcompact crossovers that offer good gas mileage along with the practicality and style of a tiny SUV. And if the car companies’ predictions are right, vehicles like this, the Chevrolet Trax, will soon be dominating the entry-level market. I drove the Trax for the first time last year as a 2015 model, and I thought it made sense as an alternative to economy cars with a starting price around $20,000. It was one of the first vehicles I’d driven in this class at the time. Now a year later, I just spent a week driving the 2016 Trax, a car that’s changed little from the 2015 version, and tried to see where it slots in the battle with all its fresh competitors like the Mazda CX-3, Honda HR-V, Jeep Renegade and FIAT 500X. So far, all the fighters are pretty different. The FIAT has cute styling; the Jeep is boxy and off-roady; the Mazda is fun and sporty; and the Nissan Juke is spunky. Compared to the popular mid-size crossovers, which all seem to be cut from the same nearly identical cloth, the smaller subcompacts seem refreshingly diverse with their own unique personalities. To me, the Trax occupies the middle ground in this war. It’s got a body that doesn’t look too weird and crazy, which, frankly, some of those competitors do. It’s got the handsome, traditional look of a crossover, just with smaller dimensions. 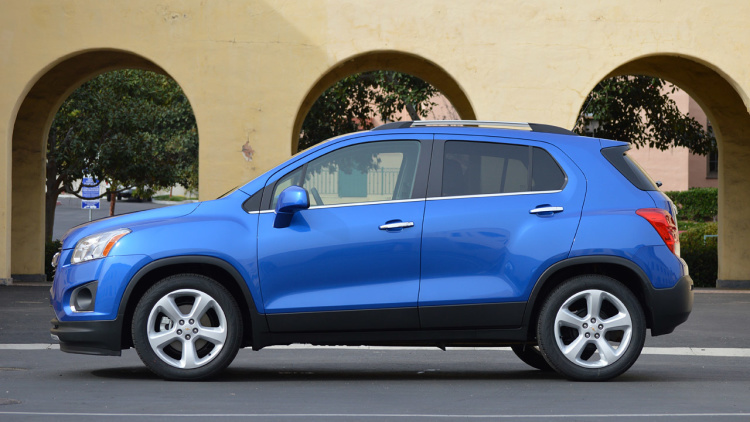 It’s based on the same platform as the Buick Encore, and it inherits just a bit of the Encore’s soft, comfy ride. It’s not as firm and sporty as the Honda, the Nissan or the Mazda, and I think that makes it better for cruising on the highway. The interior has a bit more hard plastic than I’d like to see on a 2016 car, that old tried-and-true GM complaint, but I think a lot of that can be forgiven when you look at the Trax’s base price. It starts at $20,300, including features that are optional on some of its competitors. Even on that entry-level base model you get things like an automatic transmission, air conditioning, a 7-inch touchscreen, a WiFi hotspot and remote keyless entry. My test car was a mid-grade Trax LT that added 16-inch wheels, satellite radio, cruise control and a remote engine starter that’s really nice on cold mornings, and it rang up around $24 grand. If you want to spend another $2,000, you can get the LTZ with leather seats and some added luxuries. While I think the Trax’s driving experience is underwhelming, the power from its 1.4-liter turbocharged engine being, like many cars in this class, merely adequate, I’m much more impressed with the usability of its space. The cargo area in back makes it more practical than the small sedans that start around the same price range, and its 34-mpg highway rating keeps it affordable even if gas prices were to skyrocket again. Why buy it? It has a good highway ride and nice level of standard equipment on the base model, including a WiFi hotspot, 7-inch touchscreen and remote keyless entry. It’s a stylish, practical alternative to tiny economy cars. with the 2016 Chevrolet Trax. It has the handsome styling of a crossover vehicle, only with smaller dimensions, that make it more affordable, and help it get better gas mileage. The Trax’s interior is a good place to spend some quality time on the highway, with a logical, comfortable layout, and a more compliant suspension than most vehicles in this price range and class.